Vermiculite moulds have versatile applications as custom moulds both for draping and slumping. With care, they have a long life. They are relatively light for their size and strength. As the vermiculite is an insulator it does not store heat, making it useful for large moulds without the requirement for long cooling times. It is a wet moulding process, so the cast needs to be waterproof. 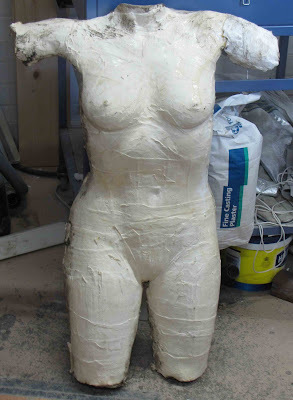 In this example a body cast is going to be used as the form for the mould. The first thing to do is to calculate the volume of material required. For an irregular form such as a torso, I measure the surface distance of the largest part of the mould - the hips in a torso - and the length. This gives an approximation of the surface area of the mould. Then the depth of the mould material needs to be added. All these measurement should be taken in centimetres. The longer the mould and the fewer curved forms, the greater the depth of the mould material needs to be. In the case of this tall cast, the height of the cast is 96cm and the distance from one side around to the other side of the hips is 45cm. This is an area of 4320 square cms. The depth of the cast was decided to be 5 cm. So the volume of material required is 21,600 cc, or 21.6 litres. This shows the advantage of using the metric system as fewer calculations are required to obtain volumes than when using the imperial measuring system. Another bit of versatility of vermiculite moulds is that you can make them hard or soft. The softer ones are easier to carve and shape subsequent to the casting of the mould, but are easier to damage. 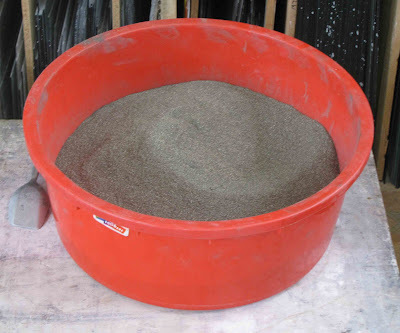 A soft mould will use a ratio of 6 parts vermiculite by volume to 1 part of cement fondu. A hard mould will use a ratio of 3 parts vermiculite to 1 part of cement fondu. You can of course vary your proportions as you wish within these limits. Any more cement fondu than 1:3 and you are both increasing the cost and the heat retention. Any less than 1:6 and there is the danger that the mould will crack easily and fall apart. You can incorporate some re-enforcement within the mould if you like, such as chicken wire. 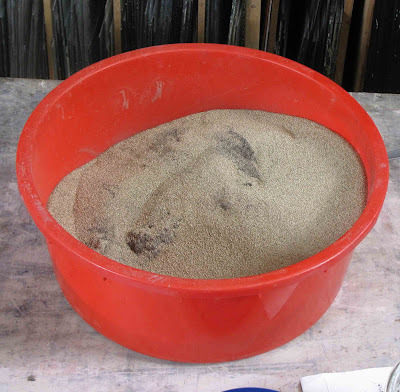 Measure out the vermiculite and cement fondu and mix them when dry. The first picture shows the beginning of the mixing. You then mix in the water to give a stiff mix. For a hard mould start with water of about 3/8 the volume of the dry mix. For a soft mould start with about half the volume of water to the volume of the dry mix. You will need to test the stiffness of the mix before filling the cast. It should be easy to make a ball in two hands that will stick together, but when pulled at, breaks apart cleanly. If you can squeeze water out of the ball, then the mixture is too wet. In this case you need to make up another portion of the dry mix and then incorporate that with the already wet mix. The cast needs a separator to keep the vermiculite and cement fondu grabbing it. Vaseline works well, as the mould mix is a wet process. The separator should be spread liberally and evenly over the mould taking area. You pack the cast by pressing the wet mix firmly down into/onto the cast to get good compaction and conformation to the surface without surface pitting. Build the mould material up in thin layers to ensure even coverage. The packed cast should be covered to keep the whole damp. Leave this for at least one day. 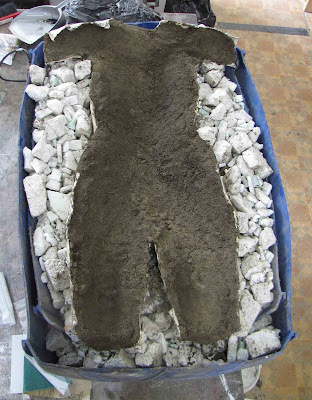 The mould and its cast should be air dried for at least one more day before taking the cast from the mould. 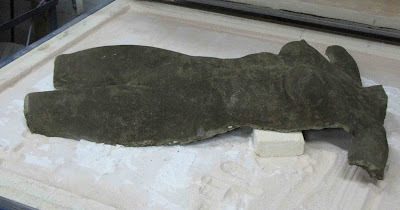 By this time, if you are careful, the mould and cast can stand while air drying. 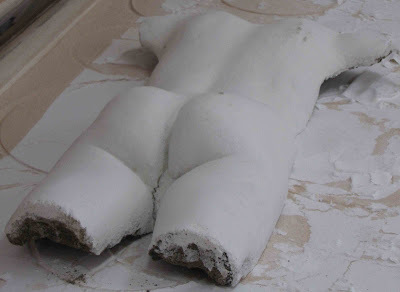 Once the mould has air dried for a while, you can take the cast off the mould. It is at this point that any gross defects to the mould can be repaired. Any protrusions can be taken away with a coarse or open rasp or other wood working tool. If there are areas to be filled, a small amount of the vermiculite and cement fondu mix can be added. 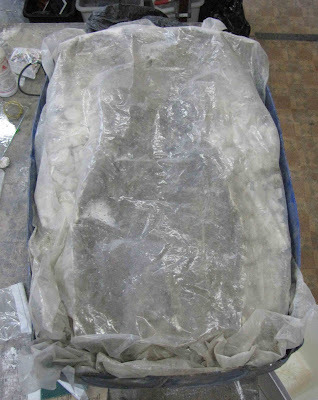 The mould needs to be wetted and the repaired area covered for a day, and then air dried for another day. The mould should be kiln cured to set the cement fondu. This needs to be done at at least 540C. To avoid cracking the mould, you need to soak the mould at 90C for a time - dependant on the size of the mould - before taking it up to the top temperature. I normally use 720C, which is beyond the slumping temperatures for any glass that I may be using in the future. Once the top temperature is achieved the kiln can be turned off and allowed to cool at its own rate. This curing process is smelly and so should be done in a well ventilated area, or overnight so the smells do not become a nuisance. 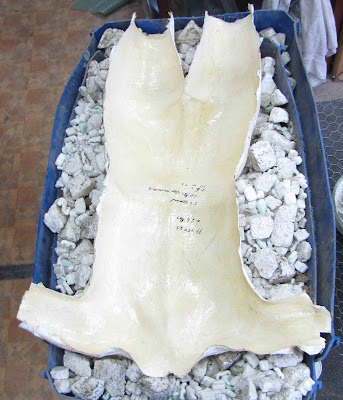 This is the cured mould, which is much lighter with the free and chemical waters evaporated. After firing to cure, the detailed work can be done on the dry mould. This requires finer grained tools than were required for the un-cured mould. When the surface is as desired, the mould can be batt washed. The mix of batt wash that I use is twice as thick as used for shelves to reduce the amount of water that needs to be evaporated from the mould. The drying should occur at 90C until no moisture comes from the kiln ports. Very useful, however I am uncertain as to what thickness the vermiculite/fondu mould needs to be.